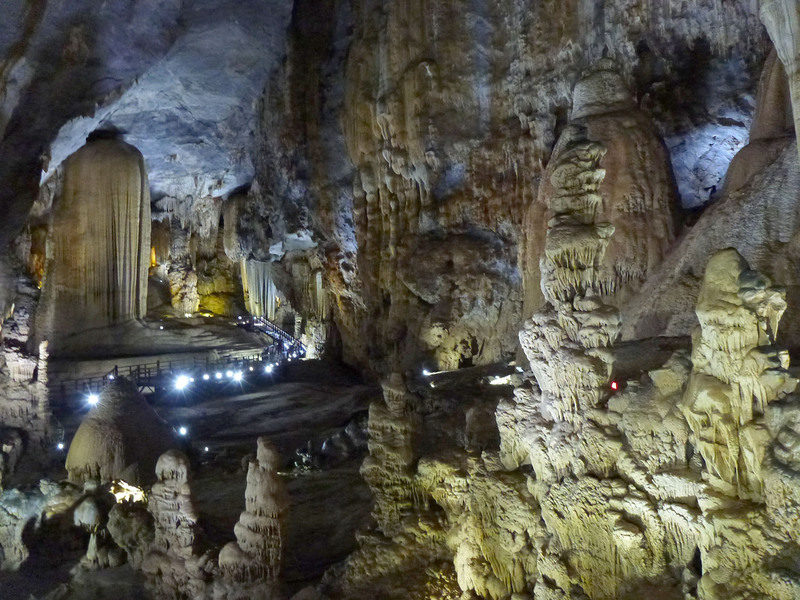 Vietnam’s Phong Nha-Ke Bang National Park is home to a number of impressive caves. I first heard about the place while reading a National Geographic article about Hang Son Doong, the largest cave ever discovered. 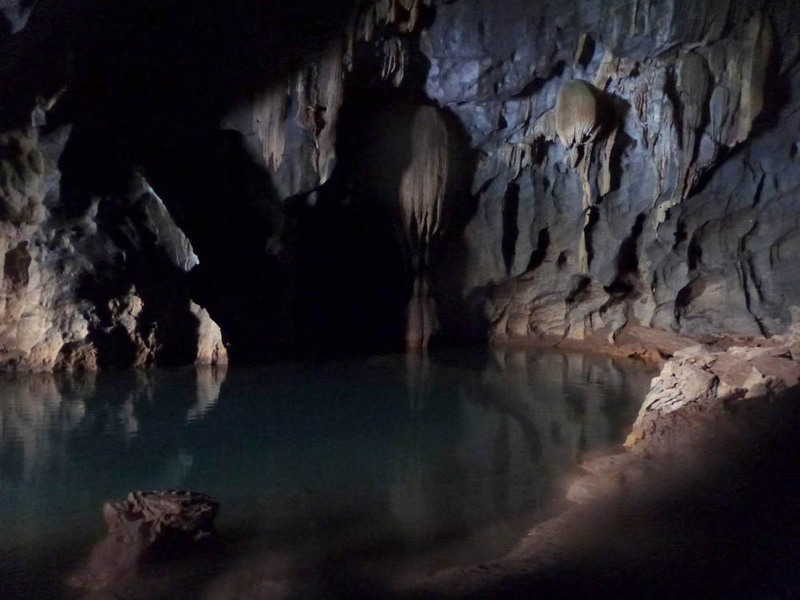 While Hang Son Doong is still being explored by professional cavers and scientists, other caves in the area are open for tours. 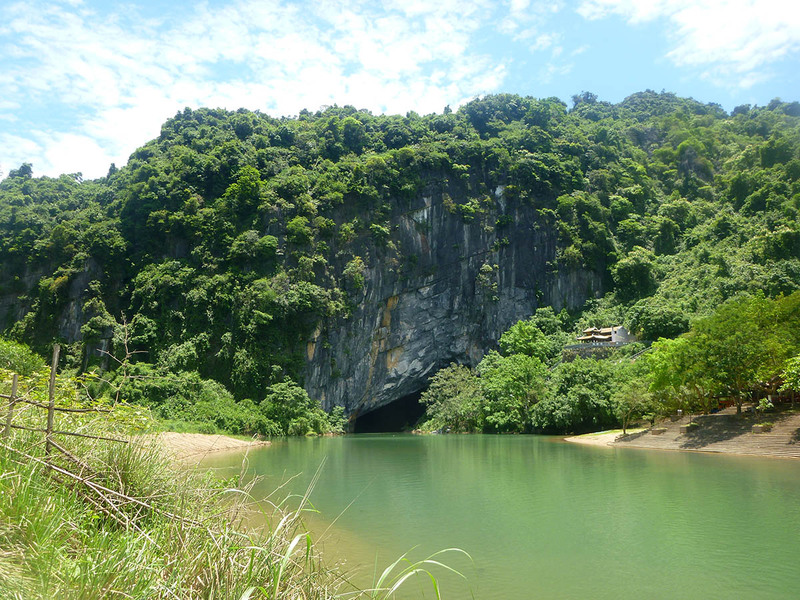 The park’s namesake cave, Phong Nha, is a hole in the mountain along the river. It is a big hole. 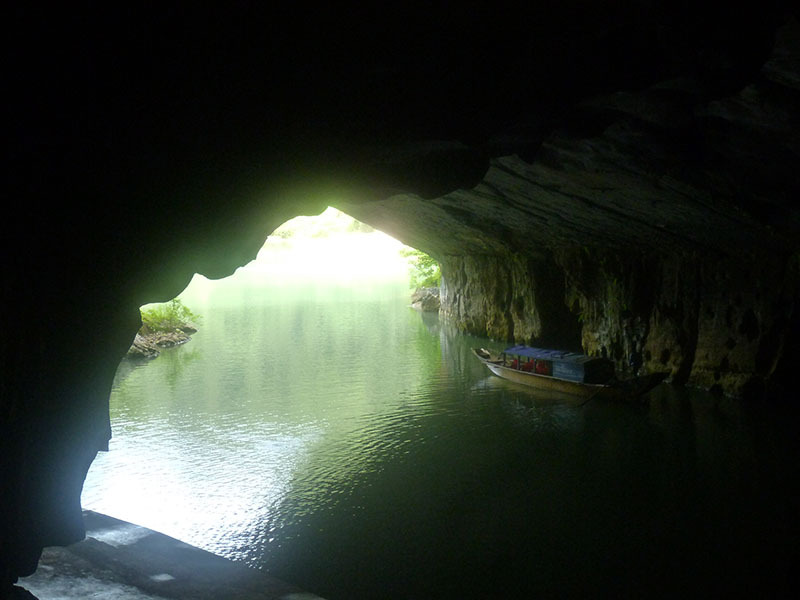 Tour boats bring visitors a short distance into the cave. 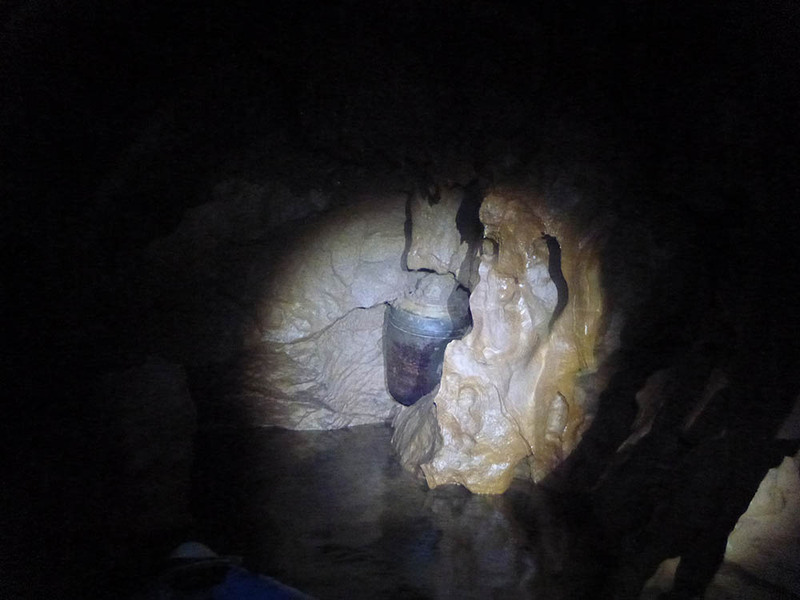 It is also possible to kayak 1.5 km (about 9/10 mile) deep into the cave. Naturally, we opted for this route. 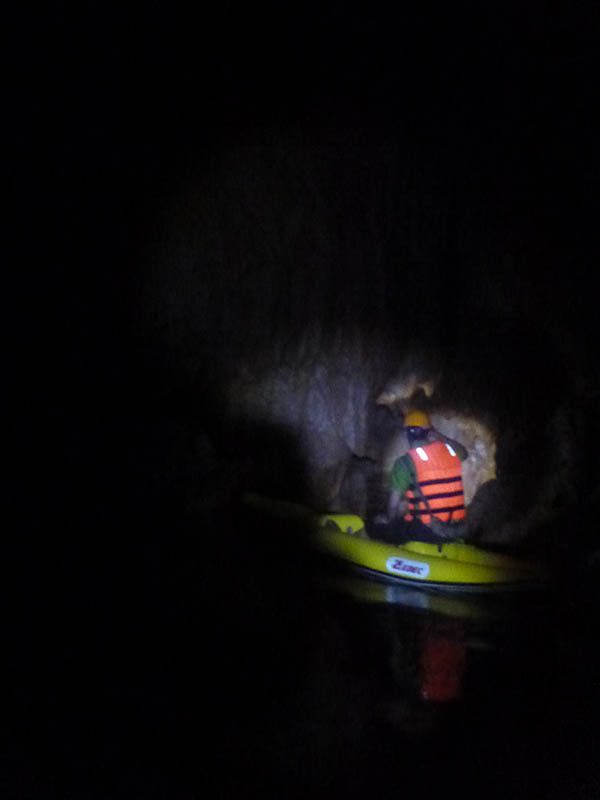 We paddled our two-person inflatable kayak past tour boats and the well-lit areas near the cave entrance. A park guide led the way while a tour company guide followed us. With the darkness surrounding everything outside our headlamps, it wasn’t easy to grasp that we were paddling through a mountain, surrounded on all sides by thick limestone. Along the way we passed an artifact from the Cham civilization, a metal drum that had somehow been wedged into the cave wall. At our turning back point, we got out of our boats and walked a short distance up through a chamber. Clambering over the steep rocks was made more challenging by the rubber sandals we had been issued for the trip – too short, too loose, and easy to slip out of. 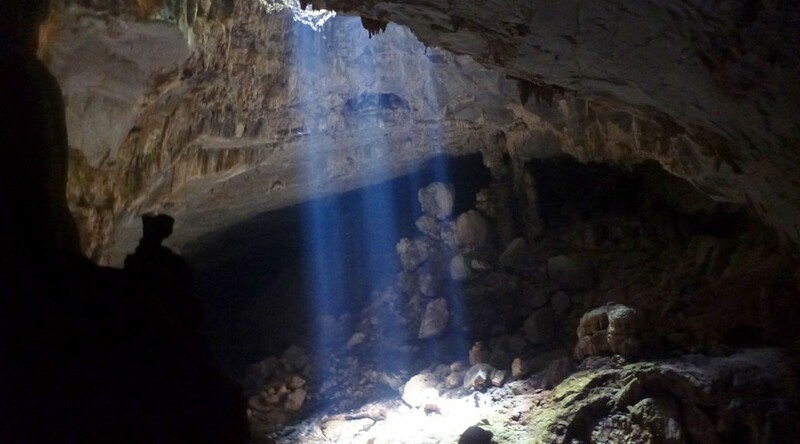 Phong Nha is in the northern half of Vietnam, and the cave was used to shelter soldiers and supplies during the war against South Vietnam and the United States. There might have also been a hospital inside. It must have been pretty spooky to sit in a dark cave all day as explosions rumbled outside. 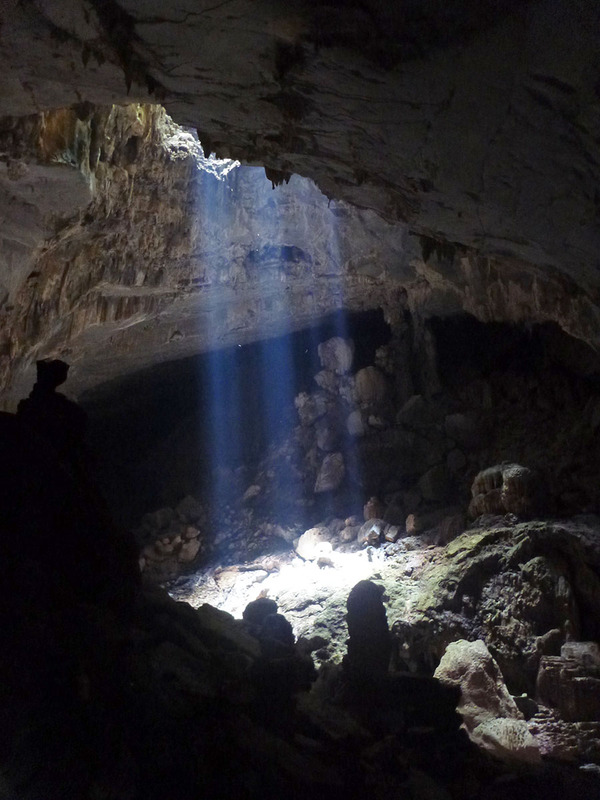 Once the American military found out about Phong Nha, it launched airstrikes against the cave. The attacks had little effect besides knocking some stalactites off of the entrance and leaving a number of shrapnel marks on the rocks outside. Our trip through the cave was completed when we crossed from the staging area to the road on a small boat that leaned heavily to one side as the pilot bailed water out of it. 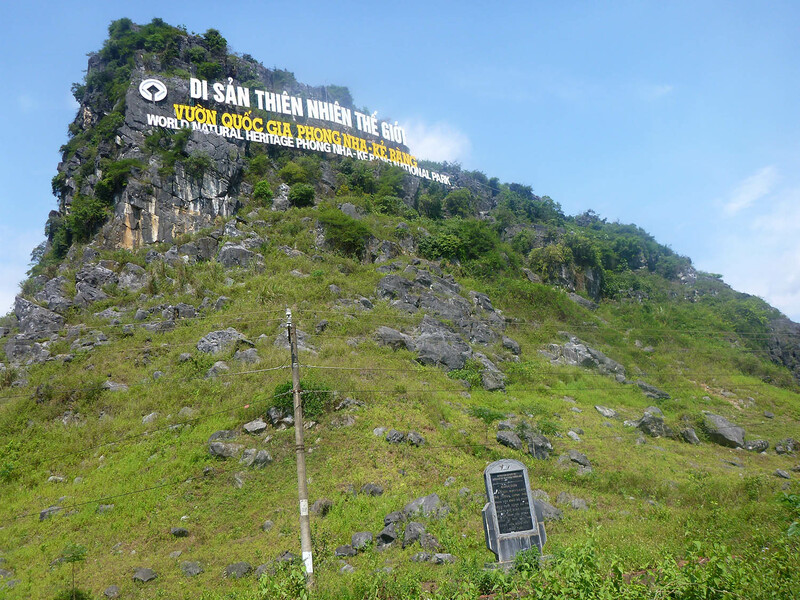 This area of Vietnam was an important link in the Ho Chi Minh Trail, a network of paths used to ferry supplies south to be used in the war against South Vietnam. Vietnam had been partitioned in 1954 after the defeat of French efforts to re-establish the colony they lost during the Second World War. The partition was supposed to be temporary, but a strongly anti-communist government with American backing took control of the south, and the two sides soon headed for conflict. By 1959, increasing repression in South Vietnam and the subsequent rise in militancy among southern communists spurred the North Vietnamese government to action. Hoping to avoid open conflict with the United States, they began infiltrating military supplies along paths through the central highlands, often across the mountains of neighboring Laos. Southern communists who had moved north according to the 1954 agreement began to re-enter South Vietnam and lead communist insurgents. The infiltration routes, which collectively became known as the Ho Chi Minh Trail, continued to be an important link in the communist military effort throughout the war with America (1964-1973). Rice paddies along the roads around the park still have holes from American bombs. There is also a monument to the trail’s role in the communist victory. Transporting military supplies across rivers could be a delicate operation. We were told that trucks driving through the night would be concealed near the river before dawn. At night, supplies were brought across the river on pontoon bridges and ferry boats that were hidden in Phong Nha cave during the day. The Americans only figured this out after a night of dropping numerous flares over the area. 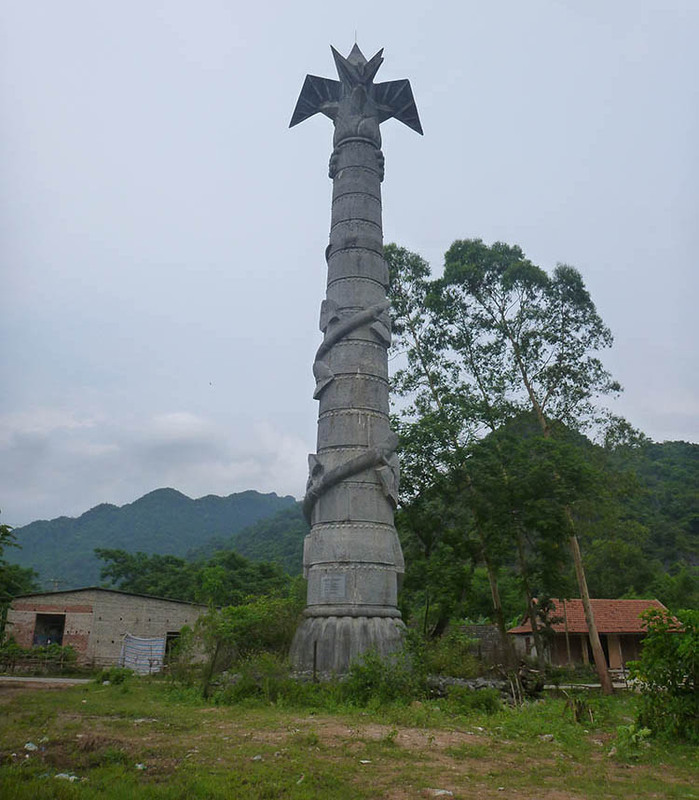 Xuan Son, an important wartime crossing, is commemorated with a small monument by the road. 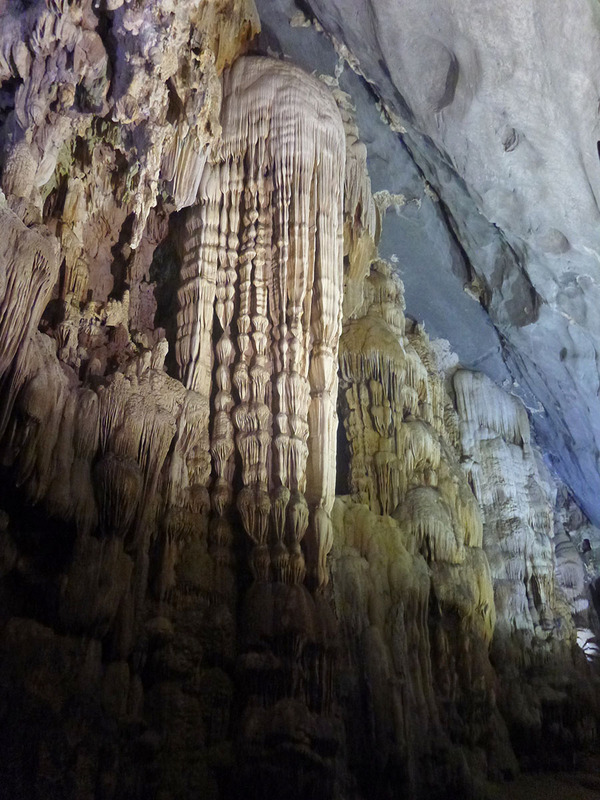 Phong Nha-Ke Bang contains a number of spectacular caves. 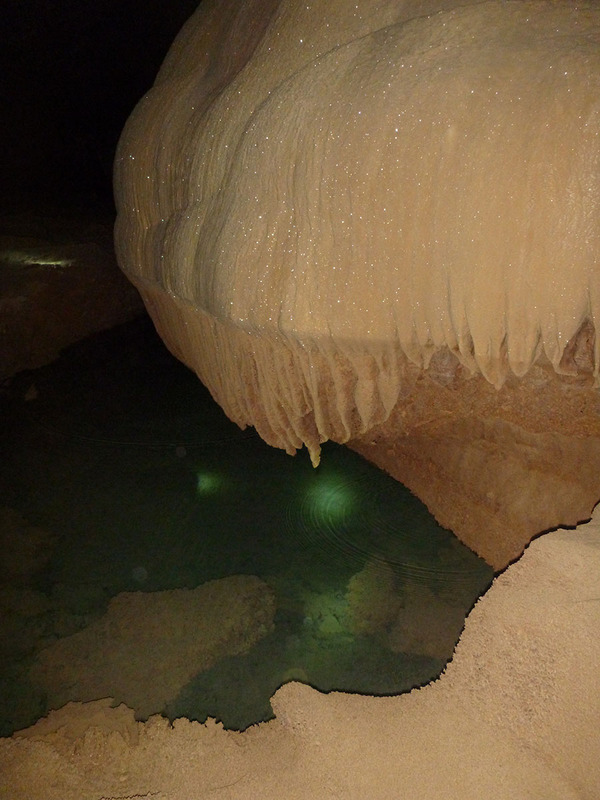 Paradise Cave is well worth visiting. It might have impressed me even more than Carlsbad Caverns in New Mexico. Our first few minutes in the cave had us walking through an area lit by electric lights. 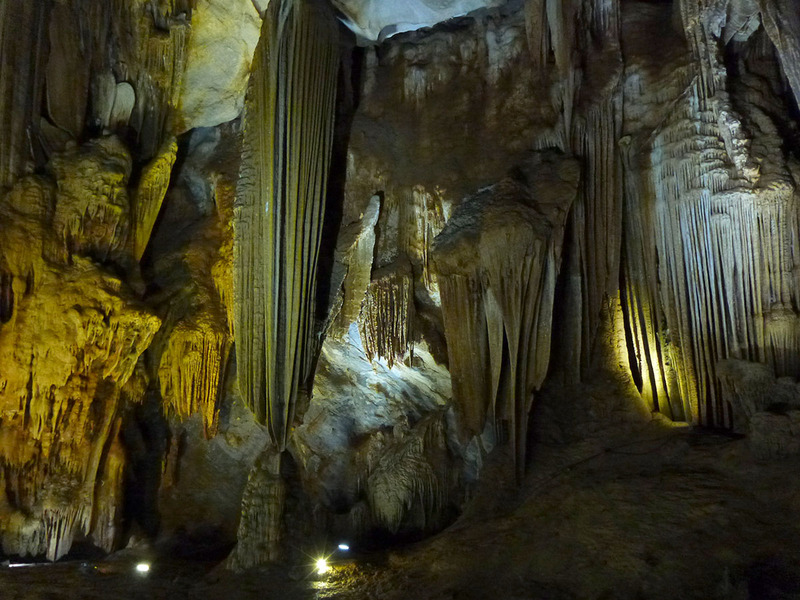 We were greeted by big caverns with impressive formations. Soon it was time to turn on our headlamps as we headed off the walkway. We passed through huge rooms lit only by our headlamps. Much of the floor was covered in sand or clay. Apparently a large percentage of where we walked floods during the rainy season. Many of the areas remain wet and muddy throughout the year, so tourists are offered camouflage fatigues and canvas boots for the trip. After our experience with Vietnamese sandals we decided to stick with our own boots. The flow of water and air created some formations that looked like the roots of plants. Occasionally the floor looked like mud but was actually very smooth rock. 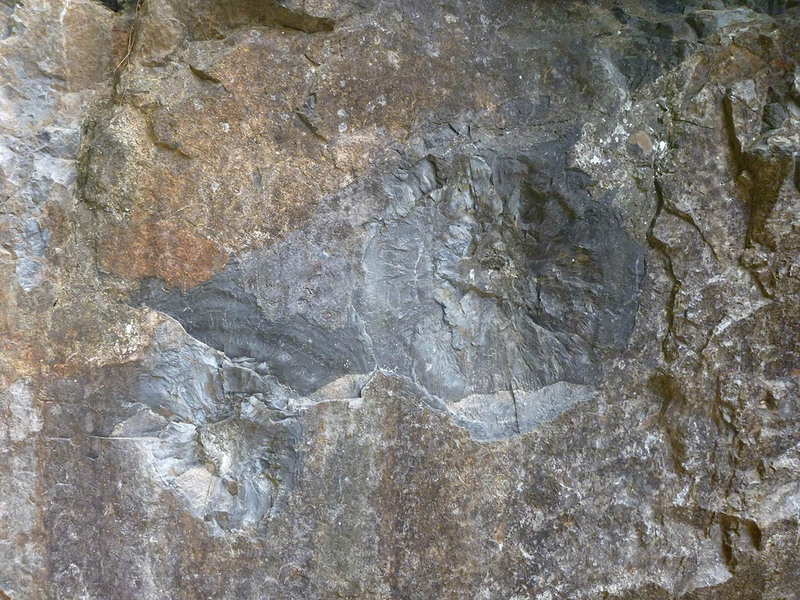 Some of the rock formations sparkle under light. And what kind of adventure would it be without the occasional spider? 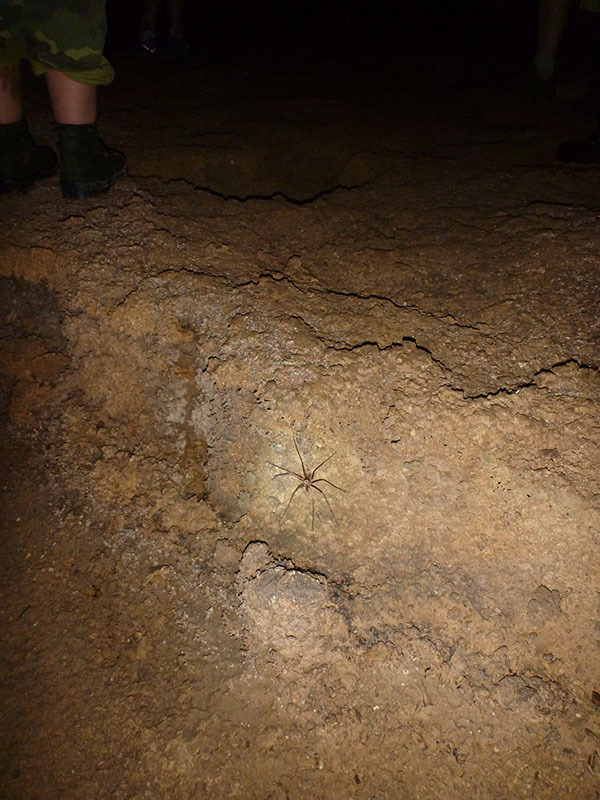 The whole trip was very exciting, but Paradise Cave really stands out for its huge room with a collapsed ceiling, about 3.5km from the main entrance. We arrived there around noon, when rays of sunlight shine down through the mountain. Looking through the hole you can see the forest high above. As a cloudy afternoon set in, we were put in a dim twilight. After a quick lunch and a dunk in a nice pool formed in the rocks, we headed back out of Paradise Cave. 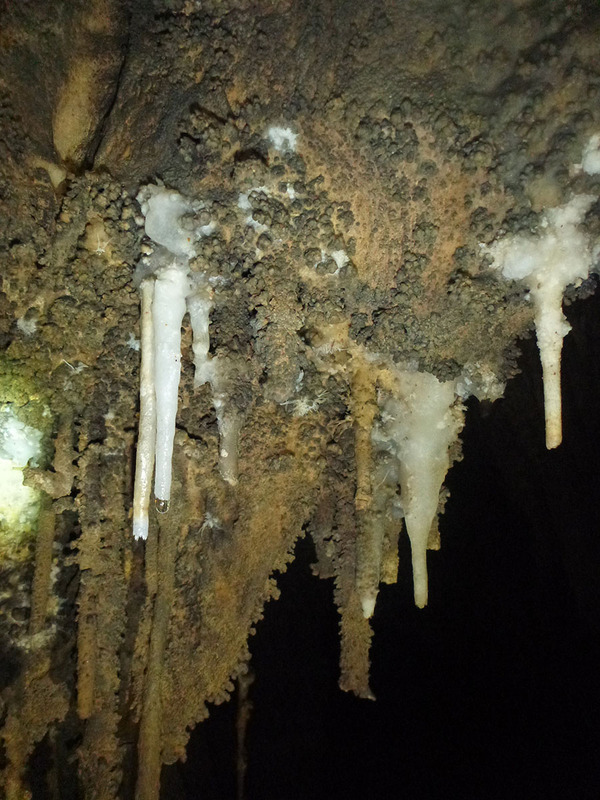 We also took a short tour of Dark Cave, named its dark limestone. Like all caves, it is dark inside. We swam through part of Dark Cave with lifevests on. 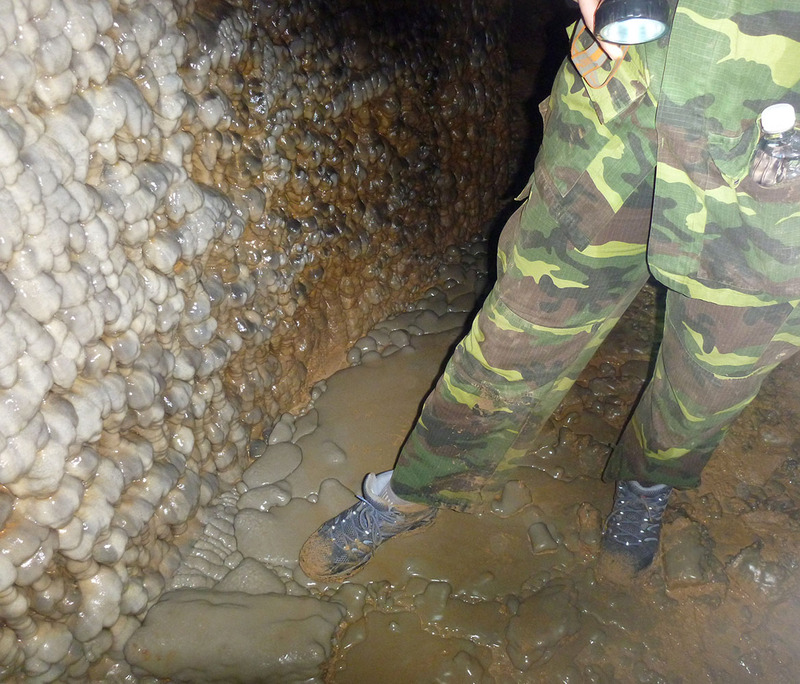 We turned back where the rocks get really sharp, but experienced cavers with the right equipment could explore further. 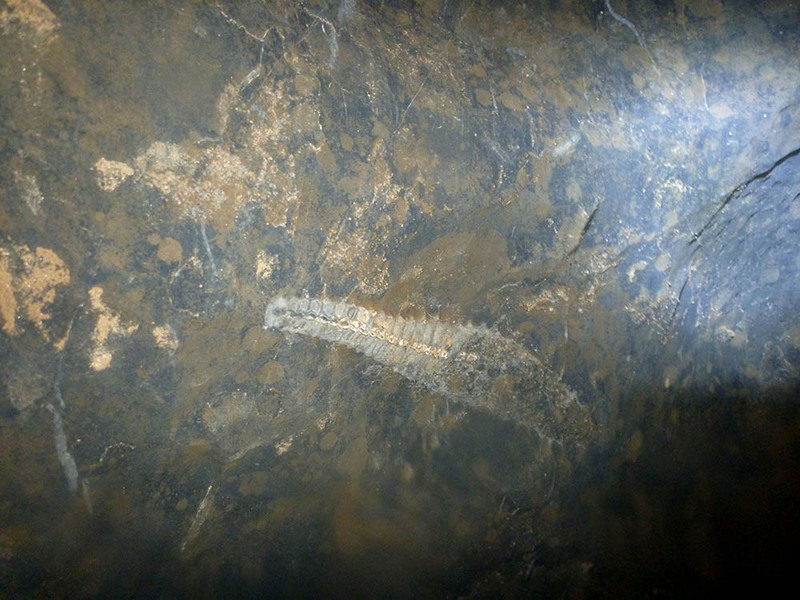 We did get to see a fossil in the cave wall. If you’re up for some Vietnamese coffee or a relaxing cup of tea, the guy who found Hang Son Doong cave runs a cafe nearby. 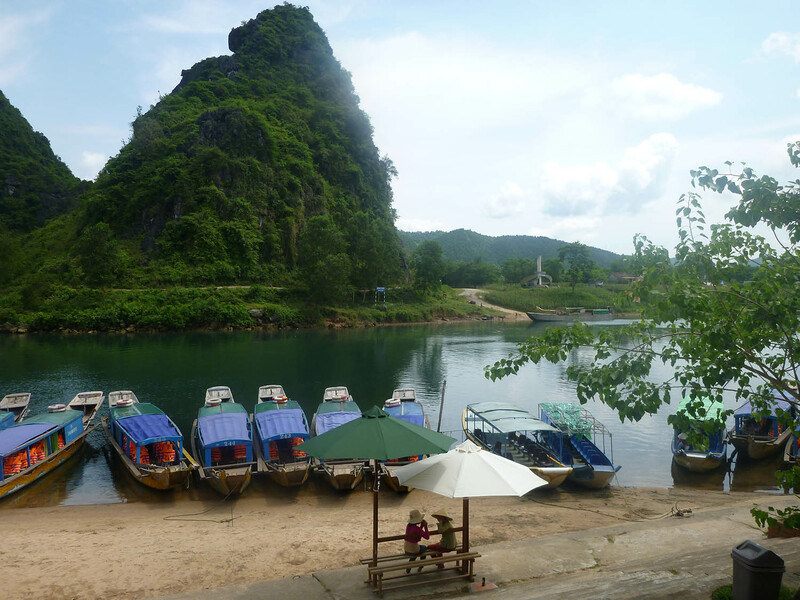 Ho Khanh grew up in a village near the Phong Nha area. He helped sustain himself by hunting in the jungle after his father was killed in the war. 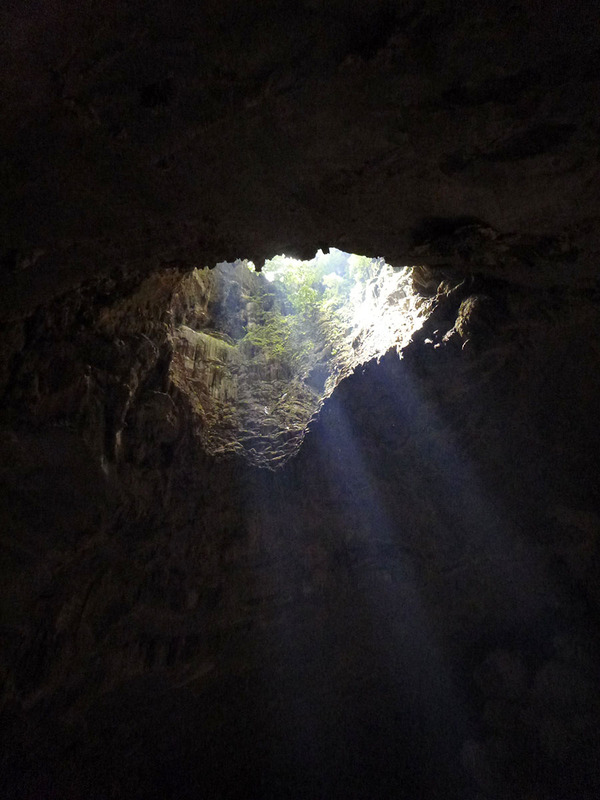 On one of his days in the forest the young Ho Khanh found Hang Son Doong. He managed to find the entrance again in 2009 and guided a British caving team to their first expedition of the cave. 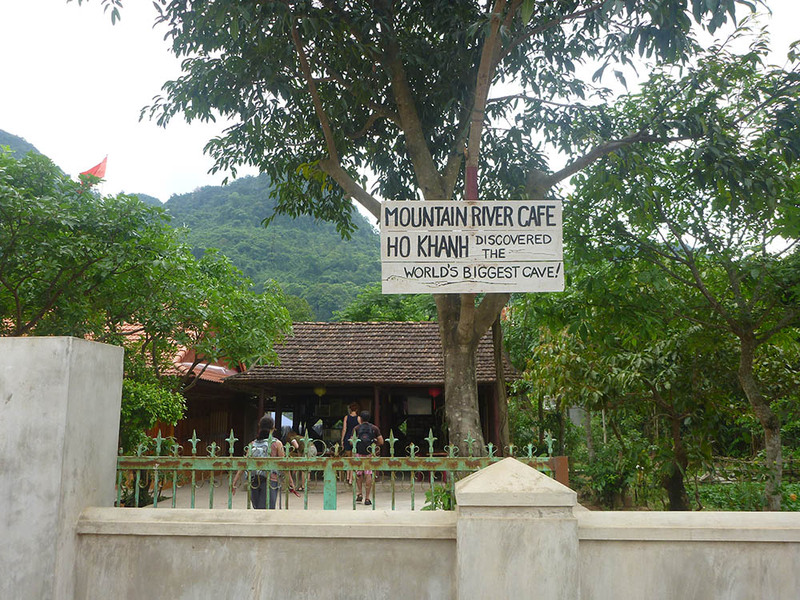 I was disappointed that Ho Khanh wasn’t around when we visited his cafe, but it was for a good reason. He was out on an expedition. The rugged and heavily forested mountains of the region would definitely make it harder to find a cave entrance. It is not easy to find maps of the area either. We were told that hiking without a guide is discouraged because there could still be unexploded ordinance in the jungle, and the narrow border region of the country has some military importance. We heard a story of an old woman who still goes out into the jungle with a metal detector and her adult granddaughter to look for bombs. With a little knowledge the devices can be disarmed and their quality steel sold for scrap. This was apparently a big part of the region’s economy after it was devastated by the war. 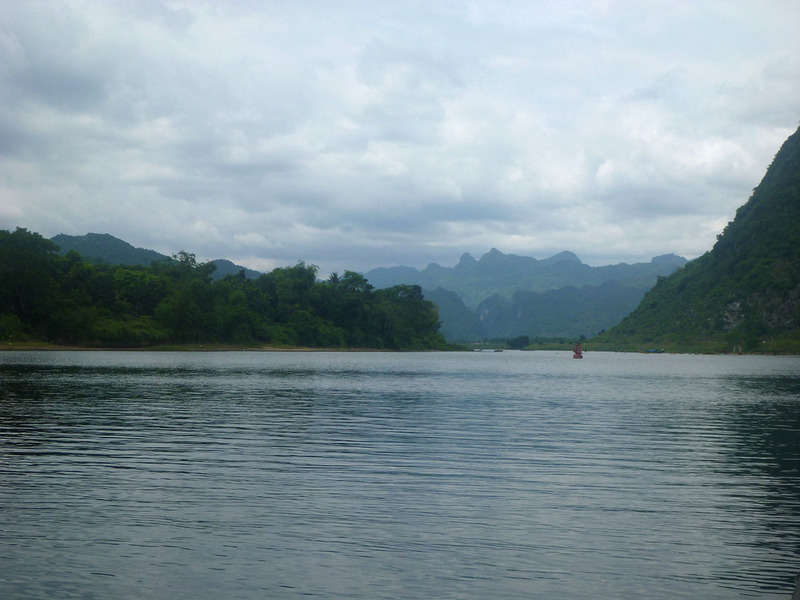 But today Phong Nha-Ke Bang sits in a peaceful green countryside inviting visitors who are up for a little adventure. Jenkins, Mark, Conquering an Infinite Cave, National Geographic, January 2011. Moss, George Donelson. Vietnam, an American Ordeal, 3rd Ed. Prentice Hall, 1998. 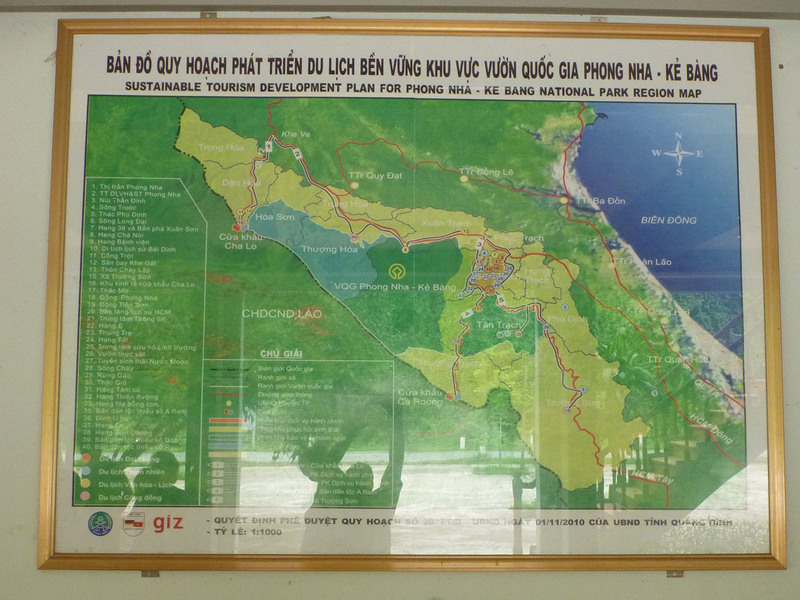 Establishment of Ho Chi Minh trail, 100-103. Routes through Laos, 240. Such of beautiful place and a great write up, really enjoying the blog. “What kid of adventure would it be without the occasional spider?” THE BEST KIND!! Spiders creep me the heck out.